McCay was a newspaper cartoonist in the early 20th century. His first film, Little Nemo (1911), was based on his comic strip Little Nemo in Slumberland. It begins with a live-action prologue, in which McCay bets his friends that he can bring his characters to life, and continues with a brief look at the process of animation. The animated sequence, for which McCay hand-colored the actual film, shows off the possibilities of the genre. “Watch us move,” says the intertitle, and two characters dance with the grace of humans, then they elongate and squish, like a funhouse mirror, demonstrating their unhuman capabilities. 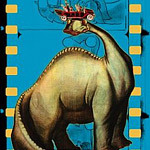 Gertie the Dinosaur (1914), McCay’s third and best-known film, brings a character with personality to life. He performed with this film on the vaudeville circuit, giving commands to the animated Gertie (in the theatrical version, the commands were given in the intertitles). Gertie bows, cries when she is scolded, and even gives a ride to an animated version of McCay. His animation technique is noteworthy. The standard method in making hand-drawn animation today is to draw the characters on clear celluloid and then put the cels over backgrounds drawn on paper. For Gertie, McCay used rice paper, which meant that the background had to be re-drawn each time there was movement. McCay adopted the cel technique in The Sinking of the Lusitania (1918), about the 1915 sinking of the passenger ship by a German submarine. It is both a moving account of the tragedy and an effective piece of war propaganda. Lusitania was a rare depiction of the real world in McCay’s films. Most of his other films feature bizarre or fantastic situations; a vagabond watches bugs perform vaudeville acts, in another, a man turns his house into an airplane to escape repossession. All ten films feature a commentary track by John Canemaker, an animation historian and author of a book about McCay. Too often, Canemaker simply narrates what is happening on screen. The commentary improves about halfway through the films, when Canemaker discusses McCay’s techniques, his influence on animated cartoons and the path of his career. Also on the disc is Remembering Winsor McCay, made by Canemaker in 1976. The 18-minute documentary consists of reminiscences by John A. Fitzsimmons, who did the tedious work of drawing backgrounds for two of the films. The most interesting special feature is a gallery, which has hundreds of photos of McCay and of his artwork. Many of the comic strips in the gallery are about bizarre dreams, the perfect subject matter for animated films. Unfortunately, these images are not accessible individually or in groups. Upon entering the gallery, there is some explanatory text for a few seconds, followed by the image for a few seconds. This continues for 47 minutes. To look at his comic strips, one has to fast-forward through 20-30 minutes of other images. The DVD features new digital transfers of the films. All of them have some scratches, but one could hardly expect better from 90-year-old cartoons. The rare use of color in Little Nemo particularly stands out. Because the films are silent, the sound isn’t important, but a new piano score gives them appropriate accompaniment.